The Field House Sports and Fitness Center has several spaces available for rental. All rentals are based on one hour rental fees with the exception of the climbing wall. Rental requests must be made at least twenty-one days in advance of the desired rental date. Click here for more information about Field House Rentals and the Facility Use Agreement. The gymnasium has six hardwood courts available for rental. All six courts have basketball and volleyball capabilities and may be divided from the other courts. Please call the Athletic Supervisor at 847-782-3620 for rental information. Bring the team in to take some swings before your baseball, softball or golf season begins. We have slow and fast pitch machines for softball and baseball. You may also add cage time on to any rental or Birthday Party Package. Cages rent by the hour for $50 per hour. Call (847) 782-3300 for date availability and prices. 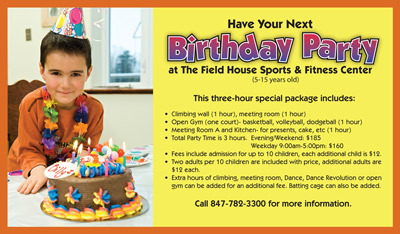 Have your child’s next birthday or team party at The Field House Sports and Fitness Center! Total party time is three hours in length and includes one hour of each: climbing wall, open gym (one court for basketball, volleyball, or dodgeball), and a party room with a refrigerator. Party Package requests must be made at least twenty-one days in advance of the party date. Fees and party packages are subject to change. Birthday Party application may be downloaded below or may be picked up at the Field House front desk. Call for date availability: 847-782-3300. Fees include admission for up to ten children, each additional child is $12. Two adults per ten children are included with price, additional adults are $12 each. Extra hours of climbing, meeting room, or open gym may be added for an additional fee. A batting cage may also be added according to availability. Looking for a new field trip destination? We have it right here for you! Your three hour field trip includes: climbing wall, open gym, and lunch room or a picnic shelter. You may add on the use of a Dance Dance Revolution machine or a batting cage for an additional fee. The Field House Sports and Fitness Center is located in beautiful Hinkston Park, which is ideal for a nature walk with your group! Call 847-782-3300 for date availability and prices. Are you looking for a new and challenging activity for your employees, team, or family? 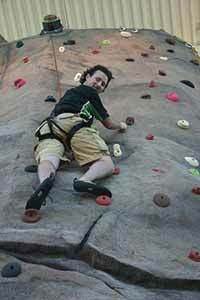 Rent the climbing wall for a couple hours and take them to new heights! Rentals are available in two-hour increments and can be reserved by itself or in conjunction with other Field House amenities. Call 847-782-3300 for date availability and prices. Looking for a place to hold a meeting, staff training, or family party? We have a meeting room that can accommodate up to 65 people. If you are looking for a smaller space the room divider can be added to make two smaller rooms. Spaces accommodate different amounts of people based on set-up. Rental applications may be downloaded here or may be picked up at the Field House front desk. Call 847-782-3300 for date availability and prices. Click here to download a meeting room rental application. Whether you’re planning a wedding reception, birthday party, anniversary, shower or family reunion, the Waukegan Park District has the accommodation for you! Call 847-360-4700 today for more information on how the Park District can help you plan your special gathering. 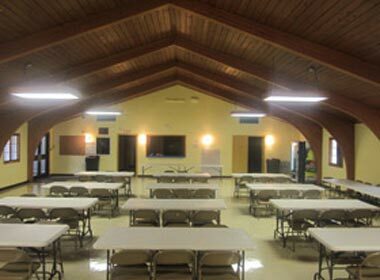 The Belvidere Recreation is ideal for family reunions, group parties, Sunday services, and meetings. With seating up to 150 people this facility can accommodate all your needs for that perfect event or meeting. Renter must be at least 21 years old to reserve a date. 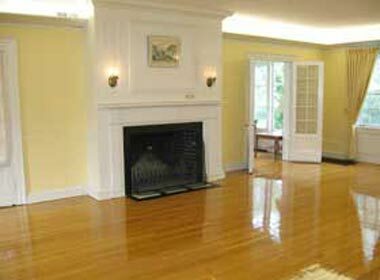 A security deposit is required to secure a rental along with valid identification. Please note if you are planning a youth party (any event for ages 13-20 years old) a police presence is required for an additional fee of $67 per hour. Reservations are accepted year round for this facility. You may view rooms during regular business hours, Monday-Friday 9am-8pm and 9am-2pm on Saturdays (May thru August), and Monday-Friday 4-8pm and 9am-2pm Saturdays (September thru April). Kitchen available: $70 flat fee. This facility is located in beautiful Bowen Park adjacent to the Janet Morrison Pavilion. It is ideal for family reunions, group parties, Sunday services, and meetings. This building will hold up to 100 of your friends and relatives and will give you not only the room inside for an exceptional event, but also the park setting outdoors. Renter must be at least 21 years old to reserve a date. A security deposit is required to secure a rental date along with valid identification. Please note, if you are planning a youth party (any event for ages 13-20 years), a police presence is required for an additional fee of $67 per hour. Reservations are accepted year round for this facility. Please contact 847-360-4700 make an appointment to view the room or obtain more information Monday-Friday 4-8pm and 9am-2pm on Saturdays. .
To reserve this space for your event or meeting contact the Belvidere Recreation Center, 412 S. Lewis Avenue, at (847) 360-4700. Are you having a bridal or baby shower? Are you looking for a bride’s room prior to for your wedding in the Bowen Park Formal Garden? Are you tired of having your company “team” meeting at the office? Tables and chairs are available for small parties of 24. Amenities include coffee makers, punch bowl and ladle, stove, refrigerator and microwave. The main room at Lilac has a wonderful sun porch* that overlooks beautiful Bowen Park. The “Blue Room” is perfect for family portraits. Rentals require a minimum of 2 hours and a $75 security deposit is required to hold the date. Lilac Cottage is not suitable for children/youth parties. 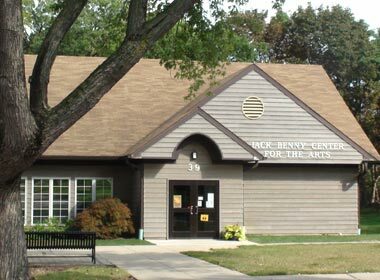 Contact the Jack Benny Center for the Arts 847-360-4740 to inquire about room rentals at Lilac Cottage. *The Sun Porch is not recommended for use in winter months. Click here for room rental information. The Dr. Lynn Schornick Theatre is the home to the Bowen Park Theatre and Opera Companies and seats up to 99 in a comfortable stadium style seating. The theatre may be rented for theatrical and musical performances as well as group meetings. Please call 847-360-4744 for details and security deposit fees. The JBC Dance Studio is available for rental for practice or rehearsals. *Cultural Arts programming allows for minimal availability of the theatre and dance studio for rentals. 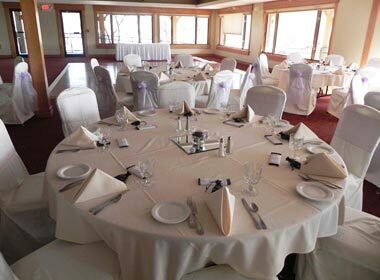 Consider the Waukegan Park District’s Bonnie Brook for your next meeting or celebration. Our picturesque setting, beautiful banquet rooms with full service dining and bar, friendly staff and careful attention to detail will help make your experience memorable for both you and your guests. Alcohol consumption is not permitted in any indoor/outdoor facility. Smoking is not permitted in any indoor facility. 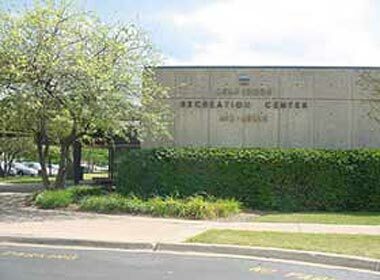 Use of the kitchen is available at the Belvidere Recreation Center, Field House, Lilac Cottage, and the Jane Addams Center for an additional fee. For continuous rentals, such as church services, please call the Reservation Clerk at 847-360-4700. No items can be stored at the facility before or after contracted rental time. At all indoor rentals, a supervisor is present throughout the length of the rental. Damage to the facility will result in the loss of the rental deposit. Reservations must be made at least two weeks prior to the rental date, youth parties 1 month. Contracted hours must include decorating and clean up hours. Failure to abide by the rental contract may result in deposit loss or shut down of the rental. Time lost will not be reimbursed. Rental deposits are return 7-10 working days after the rental as long as all contract rules have been adhered to. Each rental facility has additional rules and regulations. Please review your rental contract or permit before signing.